Dr. Wexler received his doctorate in Psychology from Stanford University. He is a professor of Psychology and Linguistics in the Department of Brain and Cognitive Science and the Department of Linquistics and Philosophy, at Massachusetts Institute of Technology. 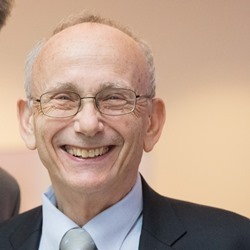 He is director of the Wexler ab/Normal Language Lab and the project affiliated with the HGARC is called Aphasic Comprehension of Raising and Passive Constructions. Thus we study immature language in the child (the development of language), language learned at an unusually late age where there might be lack of plasticity (second language acquisition), aphasia (language loss) and unusual language due to genetic factors (Specific Language Impairment, Down & Williams syndrome, autism, etc). In addition, language learning (e.g. parameter-setting) is studied via precise computational models. The lab integrates insightful ideas from current linguistic theory with intensive and extensive experimental investigations. At the same time, our theoretical and experimental results often feed back into and influence linguistic theory, for there is much evidence about the nature of the computational system of language that is unavailable to traditional linguistic inquiry, but is available under conditions of abnormal language. Hirsch, C., Orfitelli, R., and K. Wexler. In press. The acquisition of raising reconsidered. In A. Gavarro and M J. Freitas (eds.) Proceedings of the Conference on Generative Approaches to Language Acquisition. Cambridge, UK: Cambridge Scholars Press. Hirsch, C. and K. Wexler. 2007. The late acquisition of raising: What children seem to think about seem. In S. Dubinsky and B. Davies (eds.) New horizons in the analysis of control and raising. New York, NY: Springer. Hirsch, C., Orfitelli, R., and K. Wexler. 2007. When seem means think ­ The role of the experiencer-phrase in children’s comprehension of raising. In A. Belikova, L. Meroni, and M. Umeda (eds.) Galana 2 - Proceedings of the Conference on Generative Approaches to Language Acquisition ­ North America 2. Somerville, MA: Cascadilla Press.